Color: Light pink to lavender, dark rose. Description: Willow-like shrub or tree. Flower: 2-lipped, generally soft-hairy, purplish; corolla 2–5 cm, sweetly fragrant, generally light pink to lavender with yellow ridges and purple lines on throat and lower lobes, edges jagged, wavy. Leaf: Deciduous, generally alternate (often some opposite to whorled on same plant); blade 10–26 cm, ± linear, curved - resembles a true willow. Habitat: Sandy washes where subsurface water is found. Notes: Photographed June 16, 2003 Maturango Museum grounds, Ridgecrest, Kern County, Calif. A dicot, is a shrub/tree that is native to California and is also found outside of California, but is confined to western North America. Distribution outside California: to Utah, New Mexico, n Mexico. 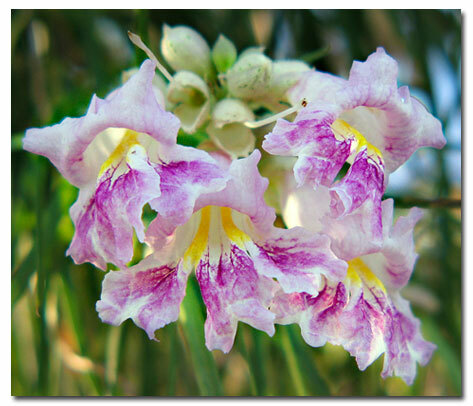 Indians had many uses for desert willow, the wood being the most important use. The branches are very pliable and not heavy, very strong and highly resistant to decay. For this reason they were used as construction materials in Indian houses. The branches were also used to make enormous basket-like structures that were used to store mesquite pods and other foods collected in large quantities. 1 species in the genus. Pollinators include bumblebees and hummingbirds. Etymology: from the Greek: resembling lips, from flower shape. Horticulture: Given excellent drainage (modification of compacted or other water-holding soils may be necessary) and full or nearly full sun (tolerates summer afternoon sun), grows especially well in zones 8, 9, 12, 13, 18, 19, 20, 21, 22, and 23 and also in zones 10 and 11.